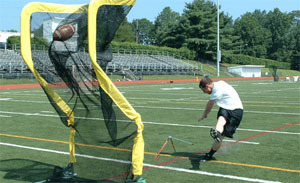 The Net Return™ Kicking Net is designed specifically for Punters and Placekickers. "The best kicking net in the football marketplace. The innovative design is ideal for kickers and it even allows punters a natural followthrough. A truly great quality product." The Net Return™ Extra Point automatically returns the football back to the punter, kicker or holder. Using the velcro Kick n' Catch feature, footballs can also be caught in the front pocket, never touching the ground. This feature eliminates warming up with wet, muddy or waterlogged footballs. The Net Return™ Extra Point also eliminates digging footballs out of the back of the net and the retrieval of balls bouncing on the field surface. This equates to 30-40% percent more warm up punts or kicks during critical game situations.